This unique shoulder stretching sequence can be done daily, and is GREAT to do when traveling. This is ideal for rebuilding and re-conditioning tight and stiff shoulder muscles and the rotator cuff (a VERY common problem). It is also ideal for preventing shoulder injuries (frozen shoulder, impingement, etc..) and random muscle pulls that plague many sedentary, de-conditioned people. 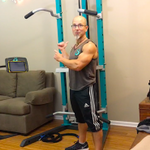 This "FLEXi-Power" Shoulder Joint Flexibility Stretching Session is part of my overall fitness/wellness plan. It has "saved my shoulders" from many issues and injuries over the last 28 years. Even just doing this 2X per week has worked wonders for many of our clients. To post questions, comments or feedback about this session, be sure to visit the Official SCULPTAFIT-Club private group zone and post in there. You already have the link bookmarked, or it is in the email that you originally received the day you became a SCULPTAFIT-Club member. Joey and his Team help families, companies and organizations implement realistic, unique and effective fitness programming that focuses on mindset adjustment for permanent behavior change that leads to health and wellness improvements for a better life in all regards.